Unique 2391-51 Written Paper Questions practice. One month minimum, cancel any time. Designed to help prepare candidates for the Written Paper Questions candidates need to pass when sitting the City & Guilds 2391-51 Practical Exam. Using this 2391-51 Written Papers Question Practice you will be confident that you will have practised similar question to those you will be presented with in the Written Paper Assessment part of the 2391-51 Practical Exam. Up to date to 18th Edition. Electricians studying Level 3 Inspection and Testing need to pass the City & Guilds 2391-51 Periodic Inspection Exam. 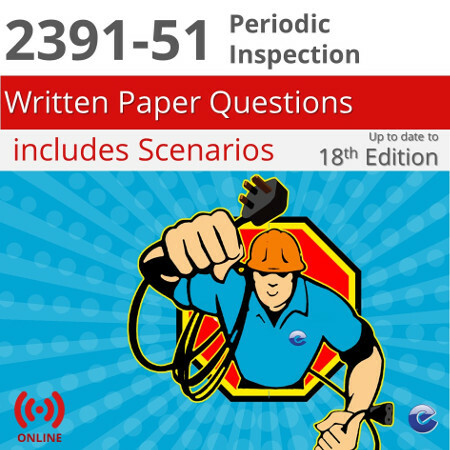 The 2391-51 Written Papers Question Practice is delivered online and as you answer and complete each question, you will be presented with a model answer. You can assess your performance and understanding against the model model answers. The Electacourse 2391-51 Written Papers Question Practice also includes scenarios with associated questions. Being able to answer questions in the context of scenarios improves your ability to recognise and understand Written Paper Questions.